My junior year of undergrad (2001-2002) was spent abroad at Reed College in Portland, OR. Even though I'm nearing my ten year anniversary as a New Yorker, my first taste of the US left an indelible mark on me and I will forever love the Pacific Northwest. After classes ended I took a two month trip essentially skirting the edges of the USA, about half the time traveling alone, taking one way tickets and staying at youth hostels. I visited the Grand Canyon, Chicago, Miami, New York, DC, Toronto, and Seattle before heading back to Portland for my flight home. Consequently Seattle got pretty short shrift, after two months of traveling mostly all I wanted to do was sleep. I took five photographs (on film) in the three days I was there, two from the top of the Space Needle. 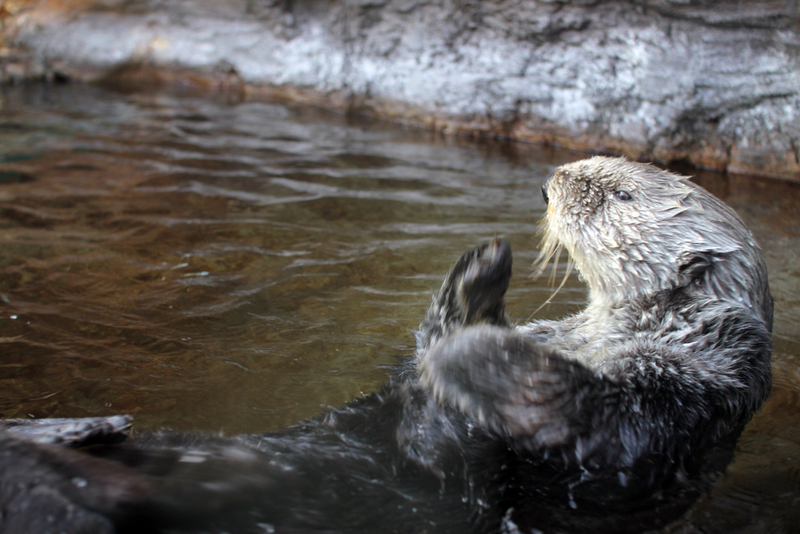 I remember very little about what I did except my loves - the sea otters. Skip forward a good many years and a few tens of thousands of air miles, and I decided to head back to Seattle to visit some friends. Naturally the aquarium was high up on my list of things to do this time around. I mean, who can resist these faces? Shooting through glass on a sunny day meant for some wicked reflections and distortions, but I'm still happy I got to see these incredible creatures up close.